Hap and Leonard, East Texas’s coolest private eyes, don't have to look for trouble, because it has a habit of finding them. That’s just what happens when driving through an apocalyptic storm they, literally run into a young woman with her tongue half severed and a SUV full of bad guys on her tail. She is a witness the local mob want silenced at any costs. Trapped in the local sheriff’s office as the waters rise the duo will need all their wits and a whole load of ammunition to keep her and themselves alive. 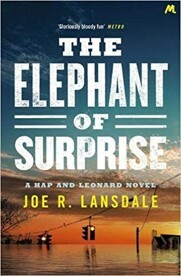 A Joe R Lansdale book seldom disappoints and this latest one is no exception. All his trademarks are there, relentless action, whip-smart wisecracks and a hint of something quietly elegiac. For all their front, Hap and Leonard as heroes are human; aware of their mortality and that of the goons they take down. This is a modern western as much as a crime novel, it’s a story of people battling against the odds and the elements to find the best and worst in themselves. Lansdale makes each new book something to be eagerly anticipated.